The location was in Alexandria, Virginia, in an alley which is a part of a big development that is less than 10 years old. The "Take It!" came as I took a closer look at the inscription on this man hole cover which I had walked on and near many times. I sometimes park my car near this piece of what I believe to be a well crafted display of iron work. Utility covers like these are to me a sort of lid on a mystery. Yes, I know there are great big things below it which we need, to have our cities function. I cannot exactly say I take them for granted but I sure can say I do not give them much thought when I am zooming down a road that is punctuated with them. This cover caught my eye as I walked next to it. To see its centered identification label "Storm" grabbed my attention. In this world we are having more and more big storms. Some of which are not due to the forces of nature. This reference is a part of a big storm that is shaking the country in which this cover was made. India, which is one of the world's largest countries, is being shaken by many storms that are simultaneous. They currently have a huge awful situation which is highlighting the mistreatment of women. Corruption in government is rampant. Another overwhelming challenge is the persistence of prejudice left over from the now outlawed caste system. This last social categorization had entire sections of their populations stuck in doing different types of work. Generations were relegated to doing this. Despite their being made illegal by law, some of the practices still exist. I cannot help but wonder if this piece if placed in another context could be considered a work of art, was made by those still laboring in an old way of doing things, and being viewed. I look at this photo and have a silent wish for progress for well being for this country of India, which is having such painful struggles. When passing this piece when walking, I think of it as a little sample of how the world is connected. I am grateful to be living here, despite our flaws, is a wonderful country. 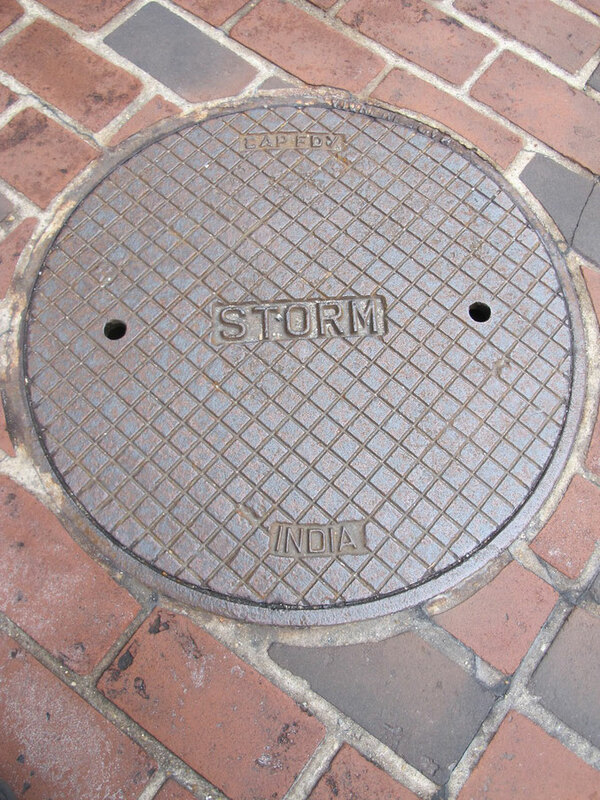 PS: This happen upon subject, has me now looking at other man hole covers with a new found interest and respect. I look forward to sharing what I think are some very interesting photos of these static but very important players in our lives. Terrible thing what those men did to that woman.